postcard #3. Your Own Private Prison Part I. Writing of Foucault’s late work on the self, philosopher Todd May suggested that all that really happens with Foucault’s shift from a focus on the subject to the self is that we get to choose our own private prison. ‘For Foucault, freedom is not a metaphysical condition. It does not lie in the nature of being human, nor is it a warping, an atomic swerve, in the web of causal relations in which we find ourselves. To seek our freedom in a space apart from our encrustation in the world is not so much to liberate ourselves from its influence as to build our own private prison.’ Todd May, ‘To Change the World, to Celebrate Life: Foucault and Merleau-Ponty on the Body’, Philosophy & Social Criticism 31:5-6 (2005). In the future, all prisons will be privately owned with one half of the population hired as mercenaries to protect the other half from one another. Or perhaps the design and running of prisons will be crowdsourced, funded through kickstarter with contributors getting leftovers from the prison canteen for $50, confiscated shanks for $150, or the opportunity to spend a night in a cell with Mark Chapman for $1000. For now our Benthamite fantasies remain limited to the virtual world. 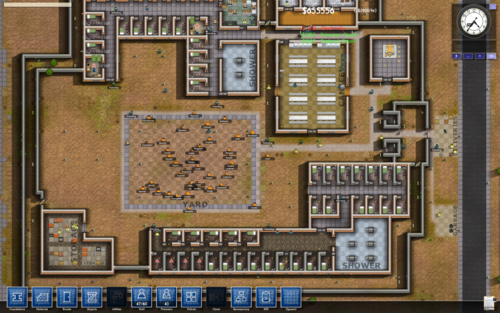 Forget designing and running your own virtual rollercoaster theme park or hotel – what could be more exciting and rewarding than working out how to construct and manage a maximum security prison? As a (incredibly successful) crowdfunded project – you can also cast yourself as master criminal or prison warden (this option costing a hefty $6000 has already sold out). Imagine Charcot doing a selfie.